The technique of heating metal and forming it into works of art was the intriguing factor that led me to become an Artist Blacksmith. I am inspired by the elements of nature as well as the lines nature creates. Much of my work reflects this inspiration. The challenge of designing and creating a piece to meet a specific need is my motivation for continuing this craft. To create ironwork that gives others enjoyment while serving a purpose is my most satisfying work. 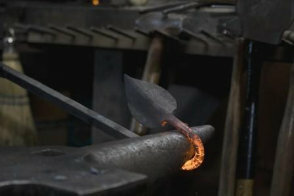 I use the traditional method of heating metal in a forge and forming the metal with hammer and anvil. This method has a long history of providing ironwork from it’s most simplistic form to the most ornate. As I continue in the tradition, I seek to establish my own unique designs that will be both visually pleasing and functional.